Studio suite with 1 bedroom, kitchenette and bathroom. Sleeps 4. 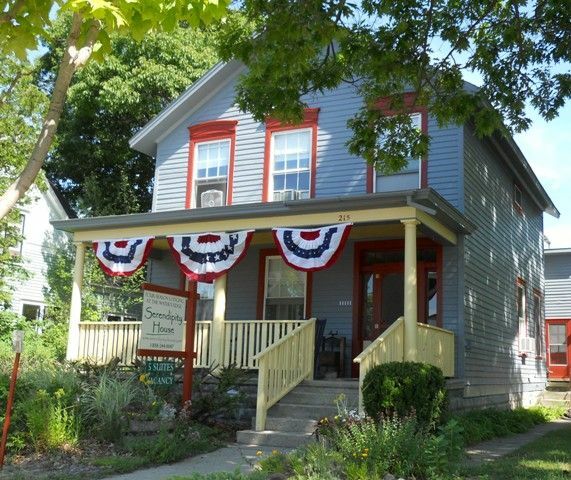 Located in Frankfort a block from Lake Michigan, Serendipity House offers five charming suites just steps from the beach. Pack your beach gear and head right to enjoy Lake Michigan's beaches and spectacular sunsets. Cross the street to start biking the 22-mile Betsie Valley Bike Trail. Or head left to enjoy downtown Frankfort's unique shops and restaurants. Then come back for hiking or driving through the autumn colors; winter downhill and cross-country skiing; and the trillium and morels awakening to spring in the area forests. With 5 suites, we're also well-suited for wedding parties, family reunions, or for sharing vacations with friends. We're listing the Betsie Suite; but if the dates you'd like are not available on the calendar, we invite you to visit one of our other suites: Manitou (HomeAway #180215); Nannybird (HomeAway #186194); Lakeview (HomeAway #188035); or Sandune (HomeAway #185719). Tim Bannister got into innkeeping accidentally, when his stepfather surprised his mother with the purchase of a resort with a motel and 12 cottages in nearby Arcadia. It was a long, colorful and rocky road until the resort was sold off in 2007, but Tim learned a great deal as an innkeeper ad decided to build off that experience. Pierside Lodging had been a bed-and-breakfast that had closed 4 years earlier when Tim purchased the property. Built in 1890, the house had a long history as an inn, going back to its hosting of the workers who built the nearby Frankfort Pier. Today, Serendipity House is a one-of-a-kind inn tailored to vacationers who want a unique experience that incorporates their accommodations. Situated on Main Street a block from Lake Michigan and at the edge of Frankfort's charming downtown district, the inn recalls earlier times when residents called out greetings to passersby from their front porch. Serendipity House has the porch, as well as updated living space with the amenities for vacationers who enjoy something unique. Small, but comfortable, the bathroom has a large shower and vanity sink. We are a block east of the Lake Michigan public beach and several miles of walkable beach, as well. We're just a block from the edge of the downtown district, which includes the restored Garden Theatre, Storm Cloud Brewery, and unique shops and restaurants. Serendipity/Betsie faces the Betsie Bay across the street. Yep, we provide high-quality bed linens, as well as all paper products, coffee, tea and popcorn. You only need to bring your personal bath products. There is street parking in front. Park in the morning to secure your spot, mid-day and weekends it is busy, especially during Fourth of July. Beach, shops and restaurants are within walking distance. We provide high-quality towels, as well as all paper products. You only need to bring your personal bath products. Plenty of room in the backyard for games. Crystal Lake Adventure Sports across the street rents paddle boards, kayaks and canoes for exploring the nearby Betsie and Platte Rivers. Big front porch with view of Betsie Bay. We're 15 minutes from several challenging public courses, including the internationally renowned Arcadia Bluffs. Location, location, location! We are a half-block from the start of the 22-mile Betsie Valley Bike Trail; one block from the Lake Michigan beach; one block from the restored Garden Theatre and our very own Storm Cloud Brewery; and two blocks from the start of Frankfort’s unique shops and restaurants. Only 20 miles from Sleeping Bear Dunes. Convenient to the lake, walking to good restaurants, comfortable beds. We really enjoyed coming to Frankfort. Good side trip to Sleeping Bear Dunes well worth the time. Nice,clean,easy access.Perfect location.Will be back. Serendipity/Betsie is located in Frankfort, Michigan, across from Betsie Bay and a block from Lake Michigan and its sandy beaches and breathtaking sunsets. Frankfort began life as a central point for shipping lumber, and with its proximity to water, woods and sand dunes, it eventually evolved to a vacation destination. Today, Frankfort features a walkable downtown with quaint shops, one-of-a-kind restaurants and a restored movie theater. The 22-mile Betsie Valley Biking Trail begins across the street, while within a half-hour drive are several vineyards, organic markets, and art galleries. Reservations made with less than 30 days to arrival are paid in full. Holidays and adjacent days are charged at the weekend rate. Guests will receive 100% of their paid rental costs, if they cancel up to 30 days before the start of their reservation. Guests will receive 50% refund of their paid rental costs, if they cancel up to 14 days before the start of their reservation.